Andrew Gale admitted there were a few nervous moments at Headingley last night for his Yorkshire Vikings team against Northants Steelbacks – but he was always confident they would get the job done and keep their Vitality Blast campaign on track. Kane Williamson proved the star attraction once again for the hosts, a sublime unbeaten 52 making light work of the visitors’ total of 129-7 from their allotted 20 overs. 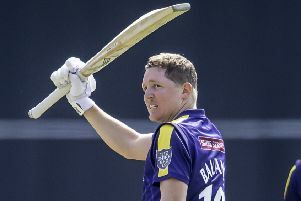 The six-wicket win was enough to move the Vikings up to third in the North group standings, level on points with Durham who, along with leaders Worcestershire, have played a game less. Yorkshire’s bext encounter will be next Thursday’s sellout Roses clash with Lancashire Lightning at Headingley. “It was a bit shaky at times in the chase having lost Adam Lyth first ball, but Kane held the innings together and played a really mature knock,” said a delighted Gale, last night. “It was exactly the kind of performance that you want from your overseas player. “I said to the lads at the start of the day ‘The only thing that will cost us is a win is complacency’. Gale said he and his players expected a low-scoring affair having seen the wicket before the game, although any early concerns they had in their reply eventually proved unfounded. “We knew the pitch would be a little bit tacky,” added the Yorkshire first-team coach. Kane held the innings together and played a really mature knock. It was exactly the kind of performance that you want from your overseas player. “It was originally going to be used for the Derbyshire game that was cancelled (last month), and we were a bit worried about it. So we knew we had to be smart, and we were. It wasn’t a shirt front like it usually is here. Steelbacks coach David Ripley was understandably disappointed,. “The changing room feels a better place when you’ve fought hard,” he said.